I’ll just come out and say it. If you had asked me a few months ago if I thought Eddie Bauer made clothes I would want to run in, I probably would have chuckled and moved on to the next question. It just wasn’t a brand that came to mind when I thought of trail running. So when they offered to send me a few winter items, described as being perfect for trail running, I was a bit surprised, but I also knew I had to give them a shot. Before I go into all the details below, let me just say that Eddie Bauer threw me for a loop. In the best way possible. Which is why the Eddie Bauer Sandstone Soft Shell Jacket I’ll be reviewing below is my #1 choice for mid-weight running jackets this season. And for the sake of full disclosure, I should also mention that this post is sponsored by Eddie Bauer in return for an honest review. All the thoughts are entirely mine, and their sponsorship has nothing to do with the fact that it’s now my favorite jacket (well, except that I would have never bothered to give it a shot otherwise, so thanks for that EB!). 1) Breathability: Cold weather running is all about regulating temperature. Too cold and you can’t ever get comfortable. Too much warmth, and you begin sweating, which will cool you back off. It’s a delicate dance we’ve all hand to tango. Breathability is crucial for regulating those temperature swings. How breathable is the fabric? Does it have air vents? These are the types of things I’m asking. 2) Flexibility: When you’re swinging your arms back and forth, moving (or stumbling) over rocks and roots, and huffing your way up a steep incline, you want a jacket that moves along with you instead of constricting your movements. Tightness around the chest constricts breathing. Tightness around the shoulders leaves you tight and puts stress on those muscles. The best jackets are ones you don’t know you’re wearing. 3) Wind Breaking: There’s simply nothing worse than a big gust of sub freezing wind, blowing through your damp clothes during a run. If you’ve had that bone chilling blast mid stride, then you know exactly what I’m talking about. 4) Good Pockets: This goes with any piece of running gear. You need to access what you want, and access it with ease. A good jacket is designed with nice pockets. 5) Compactability: If you want to shed a layer mid run, it’s nice to be able to pack it up tightly either around your waist or in a pack. How well does the jacket stuff or roll? 6) Color/Visibility: When choosing a running jacket, I want a product that will let me be seen without drawing attention. Electrifying neon greens are good for the first, but not the second. I just want to avoid cars or hunters, not look like a glow stick. Built by our guide team for high-output activities from alpine and rock climbing to trail running and cross training. Ultralight Flexion four-way stretch performance shell of nylon/spandex/polyester offers superior flexibility and breathability, and is wind- and water-resistant. StormRepel® durable water-repellent (DWR) finish beads water so it doesn’t soak into the fabric. Streamlined design eliminates bulk while allowing full range of motion. 1) Breathability: The first thing I noticed when I put this jacket on was that it didn’t have any vents, something I always look for in a running jacket. This is probably due to the fact that it isn’t designed just for running. But as I actually took it out for a spin, I was pleasantly surprised that it didn’t really need any vents. The fabric alone was breathable enough to vent out my heat and much of the dreaded moisture. 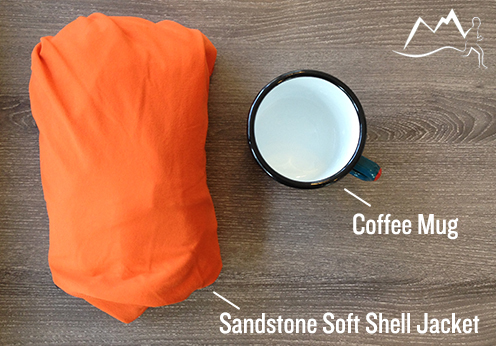 2) Flexibility: This is where the Sandstone jacket really excels. In fact, I’d even say that I’ve never worn a jacket so stretchy. I presume it has to do with the mixture of fibers (78% nylon, 12% spandex, 10% polyester), but I don’t know enough about fabrics to say exactly what it is. What I do know is that you can literally pull the jacket and it stretches, only to bounce right back. This thing moves with your body, like I crave a beer after an ultra. In other words, a lot. 3) Wind Breaking: It feels funny writing this on December 3rd, with my windows open… but just a few weeks ago we were experiencing 20 degree weather, high winds, and even some snow. I wore just this jacket with a long sleeve dry-fit shirt underneath, and was comfortable the whole time. When needed, the zip-up collar makes for a nice wind breaker around the neck, and as long as the pockets are closed, I felt no leaks. 4) Good Pockets: If I were to talk to the designers about the biggest flaw, it would be the pockets. There isn’t really anything wrong with them, they could just be better. The Sandstone Jacket has two decent hand pockets, and a chest pocket designed for a phone. Unfortunately none of them are very tight or streamlined, which means there isn’t much I could put in them and not expect to bounce. I think this is the one place where it shows that this jacket wasn’t designed just for runners. 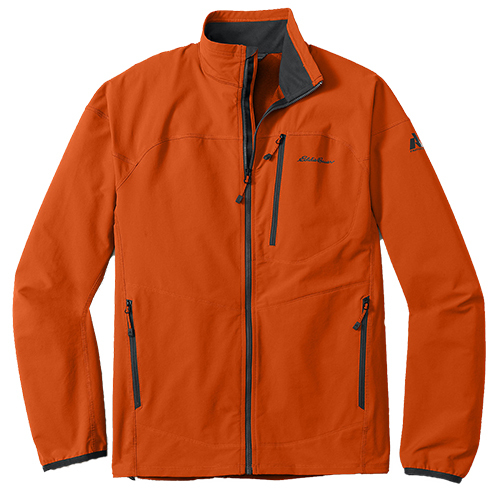 5) Compactability: The Sandstone jacket is a mid-weight jacket, not an ultra thin wind breaker, so it’s automatically going to be a little bulkier than some of the lighter jackets on the market. That said, it still scrunches up nicely, and can easily tie around the waist or be stuffed into a race vest. Check out the photo to the right, with a coffee mug for comparison. Overall, I’m crazy about this jacket. I have worn the Sandstone Jacket for nearly ever run that required a jacket since the day it arrived about 5 weeks ago. It’s the perfect weight for cool runs, and can be used as a top layer for the really cold adventures. When I first read that it wasn’t designed specifically for running, I was a bit nervous. I typically wouldn’t purchase something unless it was just what I needed. But aside from the small pocket issue and maybe a back vent, there’s nothing I’d change in a “runner” version. And both of those things can be overlooked without compromise. The total score comes to 25 out of 30. The best score of any jacket I have in my mid-weight arsenal. So does this make me an Eddie Bauer convert? They certainly showed me up! I also had the opportunity to test out the Incendiary shirt and a pair of FluxPro gloves. Both also a part of the First Assent line, and both also solid pieces of gear. All that’s to say that yes, Eddie Bauer will be on my list of brands to check out for gear in the future. Do you know of a good all-purpose jacket that could be used in cold weather? Would this one suffice or would you need something thicker? It depends on how cold! I’ve been running in this in 20-30 degrees with another layer underneath and been great. I’d even go a little colder if I had a thinker layer on underneath. Much colder than that, and you’ll probably want something heavier, but this is a great jacket for the 20-40 range. Cool review, Doug. I, too, wouldn’t have thought of EB as a go-to for trail running. Is this jacket similar to The North Face Better Than Naked Jacket? I wear that one in milder weather. Although, looks like this EB jacket has more pockets. I also noticed that EB is advertising a new shoe that could be used for trail running — I think I saw the ads in Trail Runner magazine. Hey Arun, It’s a very similar weight to the Better Than Naked Jacket. Maybe slightly thinker, but similar for sure. More pockets and better stretch, but if you’re happy with Better Than Naked, I don’t know if this one would be necessary. Good about the new shoes! I hadn’t heard that, but will definitely be looking into them. Thanks for reading! Thanks for sharing your thoughts. I was in Eddie Bauer recently, and I too was surprised by their line of suitable running clothing. Nice to have an experienced opinion on it.